Chelsea were left shocked to the core after Tottenham became the first team to put five goals past Mourinho's Blues and give them a torrid start to the new year. Diego Costa opened the scoring, but after some full throttle entertainment, goals from Harry Kane, Danny Rose and a penalty from Townsend would make it 3-1 at the interval. Harry Kane got another, Hazard responded. Chadli got another, then Terry responded. A thrilling game would finish 5-3. The title race was burst open. A great noise reverberating around White Hart Lane warmly welcomed the start of the London derby. Diego Costa was showing signs of early threat, skipping down the left wing but his cross bobbled towards Hugo Lloris. Spurs were targeting a rejuvenated response in order to avoid the thrashings they had received on previous meetings with the Blues. Harry Kane spear-headed that desire, being cut out as he surged into the box. Andros Townsend almost threaded a pass through to Ryan Mason, but the two centre-halfs were keeping Mourinho's team safe and secure. As the game wore on, Chelsea forced things in their favour, and the quality of Hazard was a key factor of that. On a great run, the Belgian evaded two defenders before directing an attempt at goal. It came off Diego Costa, clashing with the post. Oscar picked it up and fired towards the right of goal, where the Spaniard got a foot to it and gave Chelsea the lead. With the goal, Chelsea looked more menacing and the fragility of the Spurs' defence had increased. Fazio was shaken up after Oscar's brilliant dribble in the same play where the Blues appealed for a penalty, after it struck the arm of Vertonghen during a slide tackle. No penalty was awarded though and chances continued to flow from the Blues. But failure to double the lead would provide an opening for the North London side. Harry Kane expressed some quality individual talent to skip past and break through the defenders, before opening his body up to drill a shot low into the bottom left corner. It was all level. Tottenham were looking galvanised. Chadli got through but was offside. White Hart Lane was roaring. Harry Kane again burst through, and his shot hit the post. It came out to Danny Rose though who was able to slide and guide it in. Then, with half-time approaching, Cahill took down Kane in the box. A penalty was given of which Andros Townsend, with Courtois diving the same way, slotted it powerfully. At the half, it was a shocking result, Tottenham 3, Chelsea 1. Chelsea were looking to tactically re-define themselves but still remained edgy. 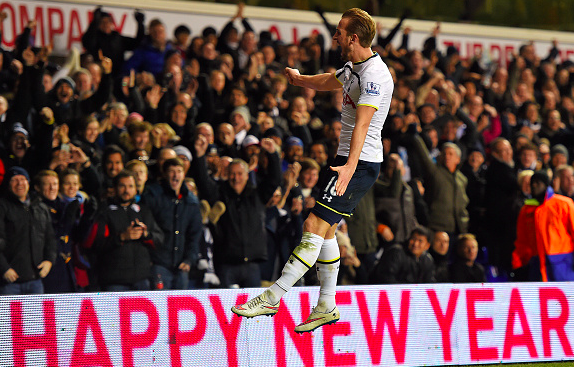 Harry Kane capitalised on that as he danced his way past the defenders and slotted it past Courtois. White Hart Lane was singing in unison and jubilation. Fazio's nightmare-defending provided some key Chelsea belief. A swift counter attack saw the ball slotted through to Eden Hazard, smashing it into the bottom right to make it 4-2. Spurs were however keen to cut that supply, as Harry Kane came close to a hat-trick, but with the angle nearing his shot was directed across the face of goal. Chelsea's attempts to creep back into the contest continued. Loitering on the left, Azpilicueta ran on to Eden Hazard's ball but was unable to beat Lloris. Desperation was settling in for the Blues. Nacer Chadli took the game away when he struck with just over ten minutes remaining. He ran into the area, picking up the ball, had a nice dribble then simply beat Courtois. Ramires managed to get in behind, but with the angle closing his shot rolled wide past the post. But Chelsea did get one back later, as Hazard's cross fell through to John Terry for a powerful tap in. Desolation marked the faces of Chelsea, with Mourinho confused and angered at the loss. A huge night at White Hart Lane.